Go to original pattern for design DROPS 178-74. Bikini top and shorts with cord ties. 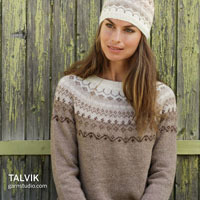 The piece is crocheted in DROPS Muskat. Sizes S - XXXL. 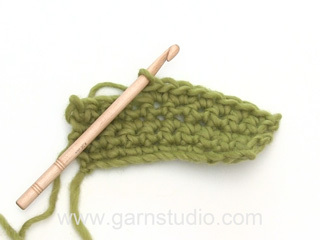 DROPS CROCHET HOOK SIZE 4 MM – or the size needed to get 18 treble crochets and 9 rows on 10 cm in width and 10 cm in height. At the start of each row of treble crochets, work 5 chain stitches to turn. These 5 chain stitches do not replace the first treble crochet. See diagrams A.1 to A.9. At the beginning of each round of treble crochets, the first treble crochet is replaced by 3 chain stitches. Finish the round with 1 slip stitch in the 3rd chain stitch at the beginning of the round. At the beginning of each round of double crochets, the first double crochet is replaced by 1 chain stitch. 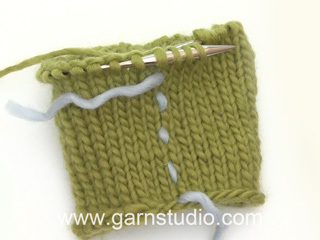 Finish the round with 1 slip stitch in the first chain stitch at the beginning of the round. Work until there are 2 treble crochets left before the marker, work 2 treble crochets in the first treble crochet, 1 treble crochet in each of the next 2 treble crochets (the marker sits in the middle of these treble crochets) and 2 treble crochets in the next treble crochet (= 2 treble crochets increased). Repeat in the other side (= 4 treble crochets increased on the round). The bikini top is worked back and forth, top down. Work 48-52-52-53-54-57 chain stitches (including 1 chain stitch to turn) with hook size 4 mm and Muskat. Turn and work as follows: Work 1 double crochet in the second chain stitch from the hook (= 1 chain stitch to turn + 1 double crochet), work 1 double crochet in each of the next 1-0-0-1-2-0 chain stitches, * skip 1 chain stitch, work 1 double crochet in each of the next 4 chain stitches *, repeat from *-* 8-9-9-9-9-10 more times = 38-41-41-42-43-45 double crochets. 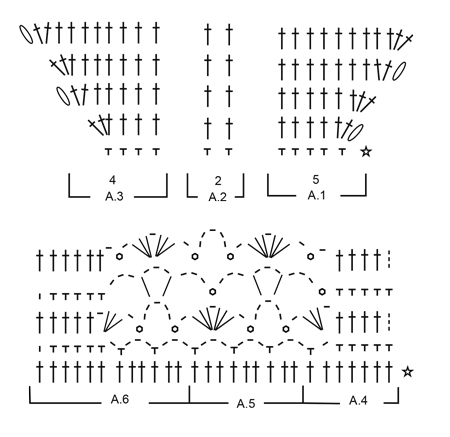 Turn and work pattern as follows: Work A.1 over the first 5 double crochets, A.2 over the next 29-32-32-33-34-36 double crochets, A.3 over the remaining 4 double crochets – read CROCHET INFO! REMEMBER THE CROCHET TENSION! When A.1 to A.3 have been completed in height, continue with treble crochets and increases in the same way until you have worked a total of 11-12-12-13-14-15 rows of treble crochets (you increase 3 treble crochets on each row). There are now 71-77-77-81-85-90 treble crochets on the row. Cut the strand. Work 1 treble crochet in each of the next 4-2-3-3-2-4 chain stitches, * skip 1 chain stitch, work 1 treble crochet in each of the next 5 chain stitches *, repeat from *-* 2-3-4-5-6-7 more times = 109-121-133-147-159-178 treble crochets. Work 6-7-9-10-10-11 rows with 1 treble crochet in each treble crochet, on the last row of treble crochets decrease0-3-6-2-5-6 stitches evenly on the row = 109-118-127-145-154-172 treble crochets. Continue working as follows: A.4 over the first 7 treble crochets, A.5 over the next 90-99-108-126-135-153 treble crochets (= 10-11-12-14-15-17 repeats of 9 stitches), finish with A.6 over the last 12 treble crochets. Work A.4, A.5 and A.6 one time in height. The last row is worked from the right side of the piece. Cut and fasten the strands. ROW 1: 1 double crochet,* 3 chain stitches, skip forward approx. 1-1½ cm, 1 double crochet *, repeat from *-*, make sure that the number of chain-spaces is divisible by 2. ROW 2: Work 1 double crochet around the first chain-space, * 3 chain stitches, 1 treble crochet in the first chain stitch, 1 double crochet around the next chain-space, repeat from *-*. Cut and fasten the strand. Fold down the outermost 2 cm in each side on the wrong side of the top and sew down with small stitches through both layers so that there is a casting to thread the cord through. Work 1 loose cord as follows: Work chain stitches with Muskat on hook size 4 mm until you have a cord which measures 140-150-160-170-180-190 cm, turn and work 1 slip stitch in each chain stitch, but make sure that you do not work the slip stitches tighter than the chain stitches! Cut and fasten the strands. Work 1 more cord in the same way. Start from the right side and thread one end of the cord through the outermost hole at top front, around the treble crochets and out through the next hole (= 2 cord ends out on the right side). Adjust the cord so that the ends are the same length, then thread the 2 ends under the cord on the wrong side and tighten. Repeat in the other side with the other cord. Then lay the cords in a cross at the back before they are threaded through the casting – see the illustration! The top is fastened by tying a knot. The piece is worked in the round, top down. Work 163-182-196-220-244-268 chain stitches with Muskat on hook size 4 mm and form them to a ring with 1 slip stitch in the first chain stitch. Insert 1 marker thread at the beginning of the round = mid back. 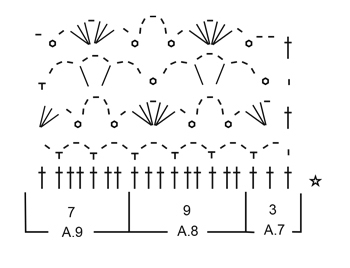 The first round is worked as follows: 3 chain stitches (= 1 treble crochet) – read CROCHET INFO, work 0-1-1-1-1-1 treble crochet in each of the next 0-1-3-3-3-3 chain stitches, * skip 1 chain stitch, 1 treble crochet in each of the next 5 chain stitches *, repeat from *-* 26-29-31-35-39-43 more times = 136-152-164-184-204-224 treble crochets. Work 1 more round with 1 treble crochet in each treble crochet. REMEMBER THE CROCHET TENSION! Now work a row of holes as follows: Work 4 chain stitches (= 1 treble crochet + 1 chain stitch), skip 1 treble crochet, * 1 treble crochet in the next treble crochet, 1 chain stitch, skip 1 treble crochet *, repeat from *-* the whole round, finish with 1 slip stitch in the 3rd chain stitch at the beginning of the round. On the next round work 1 treble crochet in each treble crochet/around each chain stitch. Then you are going to work the shorts higher in the back than the front and this is done as follows – WITH DOUBLE CROCHETS: Work 8 double crochets past the marker thread mid back, turn and work 1 slip stitch in the first stitch, then 1 double crochet in each of the next 15 double crochets, turn and work 1 slip stitch in the first stitch, then 1 double crochet in each of the next 23 stitches (you also work the slip stitches). Continue in this way by working over 8 stitches more each time you turn, until you have worked over a total of 96-96-96-112-112-128 stitches. Turn again and work back to the marker thread mid back. The piece measures approx. 11-11-11-12-12-13 cm mid back. Insert 2 new marker threads in the piece, (keep the marker thread mid back), insert the 2nd marker thread after 34-38-41-46-51-56 stitches (= the side), 3rd marker thread after 68-76-82-92-102-112 new stitches (= the side). Continue with 1 treble crochets in each treble crochet, AT THE SAME TIME on the first round increase 1 treble crochet on each side of the marker threads in the sides – READ INCREASE TIP. Increase in this way every 2nd-3rd-4th-4th-5th-6th round a total of 5-4-4-4-4-4 times. AT THE SAME TIME when you have worked 4-3-2-2-2-2 rounds, increase 1 treble crochet on each side of the marker thread mid back. 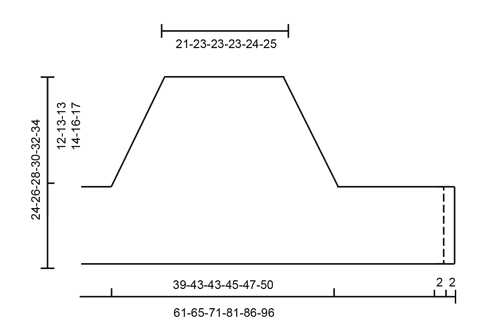 Increase in this way every 2nd round a total of 5-6-7-8-9-10 times. When all increases have been completed there are 166-180-194-216-238-260 treble crochets on the round. Continue with 1 treble crochet in each treble crochet until the piece measures 20-21-22-24-26-28 cm mid front and 27-28-29-32-34-37 cm mid back. Now divide for the legs as follows: Work 1 double crochet in each of the first 3-3-4-4-4-5 treble crochets on the round, turn and work back over the first 6-6-8-8-8-10 treble crochets (i.e. 3-3-4-4-4-5 treble crochets on each side of the marker mid back). These 6-6-8-8-8-10 treble crochets = gusset. Work treble crochets back and forth over these for 10-11-12-13-14-15 cm, cut the strand. Sew the gusset, edge to edge to the 6-6-8-8-8-10 middle stitches mid front. Continue by working the legs. 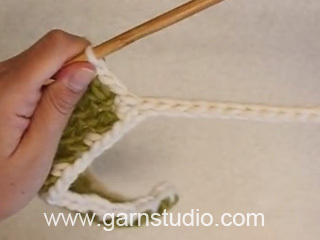 Work 1 treble crochet in each of the 77-84-89-100-111-120 treble crochets around the one leg, in addition work 14-16-20-18-25-25 treble crochets along the gusset = 91-100-109-118-136-145 treble crochets. Continue with 1 treble crochet in each treble crochet until the leg measures 4-4-5-5-6-6 cm. Work 120-140-150-160-170-180 cm of LOOSE chain stitches, turn and work back with 1 slip stitch in each chain stitch. 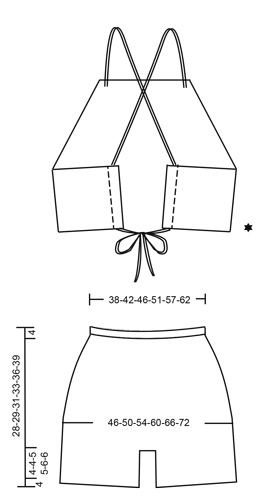 Thread the band into the row of holes at the top of the shorts – start mid front. 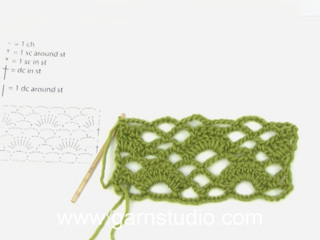 = 5 chain stitches – READ CROCHET INFO!